After several years of relentless hardware and software innovation, the mainframe is at an inflection point. It’s quickly moving from being a supporting platform of transaction revenue to becoming a source of revenue growth and innovation. Organizations are evolving toward what IDC calls the “connected mainframe.” This evolution to the platform is also enabling the mainframe to play a central role in organizations’ digital transformation (DX) journey. Key steps in achieving the connected mainframe require that organizations modernize and integrate the platform with their internal and external environments. 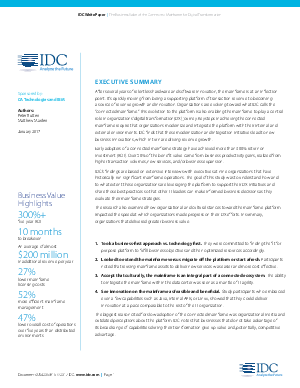 IDC finds that these modernization and integration initiatives lead to new business innovations, which in turn are driving revenue growth. Early adopters of a connected mainframe strategy have achieved more than 300% return on investment (ROI). Over 50% of the benefit value came from business productivity gains, realized from higher transaction volumes, new services, and/or business expansion. IDC’s findings are based on extensive interviews with executives at nine organizations that have historically run significant mainframe operations. The goal of this study was to understand how and to what extent these organizations are leveraging the platform to support their DX initiatives and share those best practices so that other IT leaders can make informed business decisions as they evaluate their mainframe strategies.